Many (probably most) startups go through periods of extremely little cash in the bank and with visions of crashing and burning before being able to recover. Unfortunately, crashing and burning is what actually happens a high percentage of the time after getting extremely low on cash. But it’s not what always happens and even if closing the company is the only option, there is a certain way to go about it. This article highlights some golden rules to keep in mind upon hitting really tough times, having doubts about survival and deciding how to proceed. 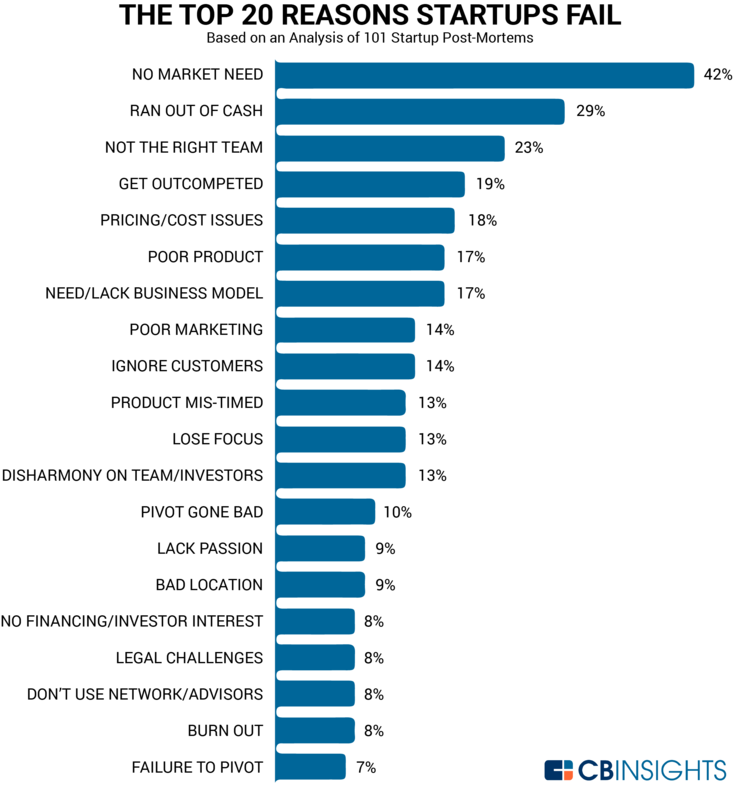 Before we get into ways to react to a near-death situation, let’s review the most common causes of startup failure. Below is the result of a survey conducted by CB Insights that can give us some suggestions. From my evaluation, I categorize at least 5 of the causes as a Fundamental Flaw of some sort and at least 11 as Execution Flaws. What I mean by “fundamental flaw” is the venture should not have proceeded past the point of Customer Discovery. For example, perhaps the market doesn’t suffer from the assumed pain or not enough to be willing to pay for a solution. Ultimately, when you are looking at a countdown clock that is getting close to zero, you have three choices. Hopefully you’ve got some trusted advisors and colleagues that can help you through this. While thinking about this, realize that most entrepreneurs are optimists and have trouble seeing the full picture. This is actually a valuable survival skill that serves entrepreneurs well most of the time because how else can they walk on a tightrope with burning fire and venomous snakes beneath them much of the time? But it also obscures their ability to make a 360 degree assessment of reality and options. Again, this is where trusted advisors and colleagues can be helpful. The good news is that desperation tends to reveal options that were always in front of you but weren’t visible until you became desperate. Let’s explore a few of the most common ones. The main thing you need to decide is if additional time is going to allow you to solve the underlying issues. That doesn’t mean just making incremental improvements but rather achieving enough success to reach “escape velocity”, which either means self-sustaining or attractive enough to raise money. And remember what I said about being an optimist. I heard someone say there are only two reasons startups fail: the founders give up or they run out of money. I actually believe there are many instances in which the best thing to do is close the company, even if it has cash in the bank and a little runway left. In other words, the best outcome might be to hold your head high, give whatever return you can to investors and move on to your next gig. If you pursue a dissolution of the company, don’t just focus on your legal/financial obligations. Spend serious time and effort trying to take care of the employees that devoted their energy and loyalty to your cause. The way you treat them and help them on the way out will say a lot about you and define your reputation going forward, should you ever want to try your hand with another startup venture. As for the legal and financial obligations, take them seriously and realize to do things properly will cost a little money. You will want to notify your customers and will want to provide a formal dissolution notice to your investors so they can at least get a benefit on their next tax return. Even if you built something really cool, your inability to create a growing and healthy business around it almost certainly means you will be selling in distress, which means a “fire sale” exit multiple if you are even that lucky (most attempts to sell a company in distress result in nothing). It is possible that the reason times are tough is due to something totally out of your control and there are three companies out there that will desperately fight to acquire you. But that is very rare and you should understand the dynamics of selling your company versus being bought (see related article titled “Are You Selling Your Company or is Someone Buying It?“). Also realize that pursuing the sale of the company likely requires board and/or shareholder approval. Negotiate reductions in other recurring bills like software licenses, office rent, etc. You might be surprised to find some vendors and service providers be willing to take less than full payment in hopes that you stay alive for a while. Raise money on a bridge note with very favorable terms. Investors will obviously need to know about the other actions you’re taking and the reason you think there’s still hope. While you are taking these actions you should run fresh cash fume projections at least every month and possibly every week. At times like this, emotions run high and true personalities come out. This is not the time to dance around the issues with your employees and trusted advisors. Honesty buys loyalty and loyalty is possibly the strongest currency you can count on when times are really tough. Regardless of the option you selected during your soul searching (referenced above), be honest. Related Reading: This article titled “How Not to Die” by Paul Graham (Y Combinator co-founder) has tons of great insights to consider. I’m sorry to report that there aren’t any spreadsheets or analytical exercises that can really help you with the needed decisions and associated actions. Tough times call for “gut checks”, reflecting on your founding principles (see related article titled, “Founding Principles – Do You Have Them?“), and deep thought. How’s your yoga?